Grab this glitter eyeshadow palette for ONLY $1.50 with Amazon.com Prime and code from gleam at bottom of blog post. Professional glitter eyeshadow: create a multitude of looks with this 15 color diamond glitter palette. Use alone, or apply over regular eye shadow for additional designs. 15 colors glitter eyeshadow: including red glitter eyeshadow,green glitter eyeshadow,yellow glitter eyeshadow,blue glitter eyeshadow,gold glitter eyeshadow,orange glitter eyeshadow,sliver glitter eyeshadow,brown glitter eyeshaodw,purple glitter eyeshadow,white glitter eyeshadow,gray glitter eyeshadow,hot pink glitter eyeshadow,cyan-blue glitter eyeshadow, darkviolet glitter eyeshadow,black glitter eyeshadow. Pressed glitter eyeshadow: no need for glue.Pressed glitter powder is easy to apply directly with fingers or brushes. 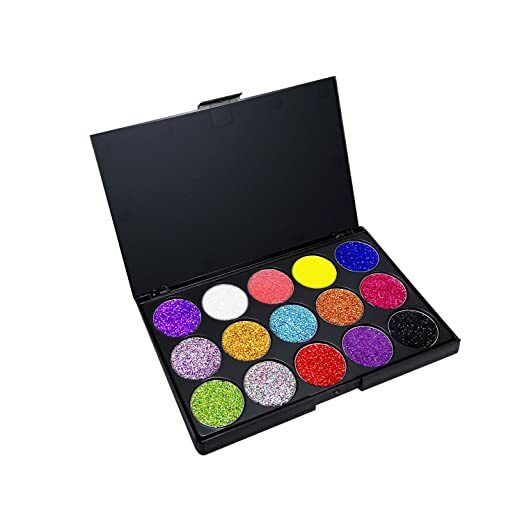 Popular glitter eyeshadow: perfect for all skin types.These vibrant colors are best applied on eyes and cheek, and are not intended for use on nails and other body parts. Widely used glitter eyeshadow: high quality makeup with easy application that’s suitable for both personal and professional salon use.Smooth fine texture with a bold variety of long lasting colors that are perfect for casual glam, wedding or party makeup and other festivals and events. This 15 color eye shadow palette has all the shimmer you need to be more gorgeous and sparkly than ever!Glitter Powder Makeup Palette is a great way to literally add some sparkle to your look.Our hypoallergenic products will not irritate your skin. Not tested on animals.